Here I am, at the end of 17 weeks of training and blogging that culminated in 26.2 miles of running. That last bit passed in what seemed like no time at all while it was happening, even though it took almost three and a half hours according to the clock waiting by the finish line. I recently came across a word that describes what marathon running is for me. An “autotelic” activity is one where the reason for doing it is intrinsic to the event itself. Most things we do are motivated by external rewards, like the need for food, shelter, or the admiration of those around us. We do an autotelic activity for its own sake, not with the expectation of some future benefit, but simply because the activity itself is the reward. There are certainly marathoners who run for the money, and there are others who do it for the show, or for some other reason, like charity. That’s not why I’ve run 21 marathons. 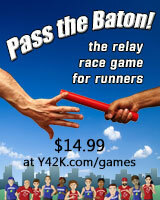 For one thing, if there’s a marathon that pays people to run a 3:25, I’ve never heard of it. People having an autotelic experience say things like they’re “in the moment”, “on a roll”, “at one with the universe”, or “in the zone”. Some people get that feeling from painting or programming or dancing. I get it from marathon running. Mihaly Csikszentmihalyi, a leading researcher on positive psychology, calls that feeling a “Flow state”. Someone in a Flow state experiences intense and focused concentration on the present moment, a merging of action and awareness, a loss of reflective self-consciousness, a sense of personal control over the situation, and an altered subjective experience of time. 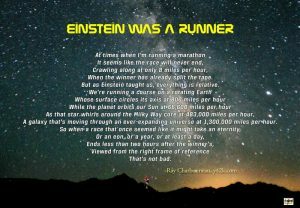 That’s exactly how I feel when I’m running a marathon, only with sore quadriceps. Flow theory says that for a person to achieve Flow, he needs a task with a clear set of goals to provide direction and structure. That task has to provide clear and immediate feedback to help the person adjust his performance and maintain the flow state. The task must be difficult, but the person should have confidence in his ability to do the task at hand. Running 26.2 miles as fast as I can is a pretty straightforward goal. I get immediate feedback from my body, my watch, and the runners around me while I’m running. And I’ve never run a marathon without some level of pain, but I’ve finished all 21 that I’ve started. Seems like a good fit to me. On the other hand, Flow experiences have been shown to foster addiction and they can encourage risky behavior. In running, we call those “the Runner’s High” and “ultrarunning”. 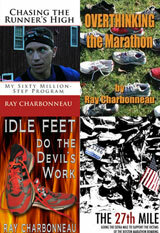 Survivors have been known to write books about their experiences. I’m still thinking about what I want to do next now that Cape Cod is over, but I’m certainly not ready to give up the hunt for Flow. Before the race, when I was tapering and gibbering with anxiety, I was ready to quit the whole training/racing thing and just run – there’d be no pressure, and I could eat all the doughnuts I want. Then I had a good race, with Flow that made everything over the last 17 weeks worthwhile. 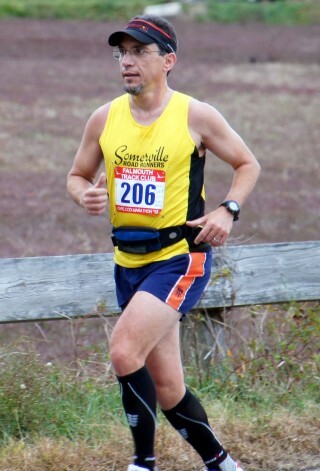 A week after Cape Cod, my legs are still tired, my neck hurts again, and my left calf has a new strain. Today, while Ruth went off for a run with her friends, I dragged myself through four miles that had absolutely no Flow. But I know that sooner or later, the Flow will return. 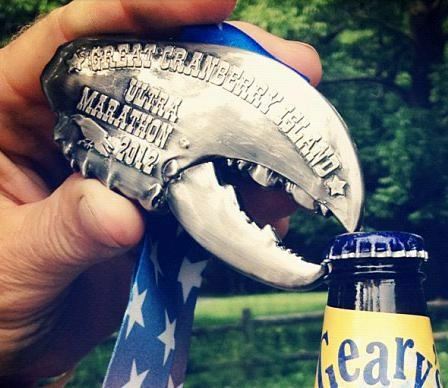 Next year, if everything falls into place, I’ll guide a blind runner at Boston and I’ll earn my Claw at the Great Cranberry Island 50K. There’s no guarantee that either of those will happen, but if not, I’ll find something. Cape Cod was less than a week ago. There’s no need to decide what I’m going to do next just yet. Meanwhile, Ruth is already making lists of potential future marathons. Thus endeth this spate of daily blogging, at least for now. I’d like to thank all my faithful readers, most especially you! I’ve got some other projects that need my attention. I’ll post news here as it happens, plus other fun stuff as time permits. I hope you’ll keep following what I’m up to using whatever method that’s most convenient for you. Thanks! Now go out and have a great run!